Nintendo Switch, the new handheld game console from the Japanese video game and console manufacturer Nintendo is the successor to the well known Wii U and comes with a new hybrid hardware concept. This means that the Switch can be used both on the TV and mobile. 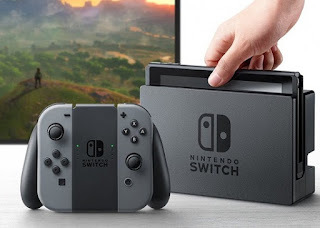 As is the case with the Nintendo Switch in terms of hardware, connectors, battery life, resolution, and performance, you'll learn about the technical details of the new console below. You have the opportunity to play with the Nintendo Switch in three different variants. As mentioned above in handheld mode, then in docking mode on your TV and even in tabletop mode. In the latter, you set up the console as a screen by folding out the small stand similar to a picture frame. Then you play with the controllers, one on the right and one on the left hand. This allows you to play with friends in multiplayer. With a local WLAN connection, you can then connect up to 8 devices and play with each other. There will also be a Joy-Con-Controller wheel available, which you can then enjoy the Joy-Con-Controller and feel like a real racing driver during the next racing game. The Nintendo Switch has an integrated battery. The battery power depends of course on the respective game and is therefore at 2.5 to 6.5 hours. In the case of "The Legend of Zelda", the battery power is about 3 hours. The game will release together with the same time as the new Nintendo console, on March 3, 2017. You can also play with the Nintendo Switch while it is loading. The supplied power supply is used for this purpose. You can also use portable USB batteries or a Powerbank. The USB should correspond to the type C.
The Nintendo Switch has a capacitive touch screen. This means that the screen can only be used with the bare finger or a special conductive input pen. The display has 720p and has a size of 6.2 inches . The mobile resolution is 1280 x 720. At the docking station of the Nintendo switch is the resolution then 1920 x 1080 large. By the way, the new Nintendo console also has a capture button, with which you can take screenshots and record videos. Only when you connect the Nintendo Switch to the docking station, it can show its full performance. Then it has the power to show games in full HD. With HDMI you can connect the console to your TV. The Nintendo Switch comes with an internal memory of 32 GB. This is of course expandable with the help of SD cards (SDHC / SDHX). The Nintendo Switch graphics is based on Nvidia's mobile processor architecture Tegra. In order for the resources of the Nintendo Switch to be optimally utilized, a separate developer tool set was written, which together with a new physics engine and additionally optimized programming interfaces should ensure that everything runs smoothly.